Here you have a “mix-and-match” design assortment. You can exchange frames, kitties “over-one” and”over-two” and pumpkins to your own taste and wishes. Lots of different ways are possible ! 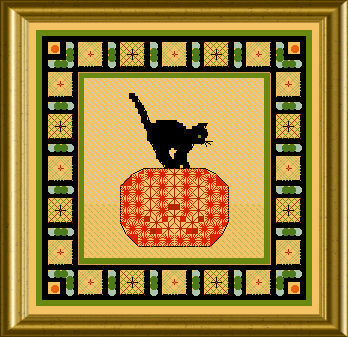 The frames feature Special Stitches and a few beads and crystals for a decorative effect. 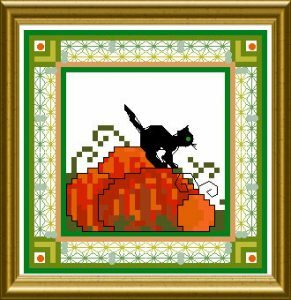 Inside you can have pumpkins with normal cross stitch, Special-Stitches filling or a field of pumpkins right away. The little kitty is available in over one, which gives more smooth lines and a petit-point look, very neat. 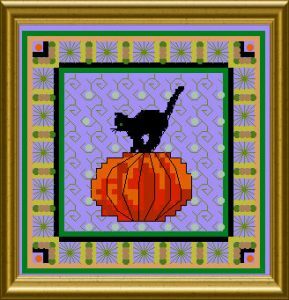 You can stitch them in a row, or single – one design has the mere size of 46 x 46 stitches and is a fast project in between…. Please see here the good idea of a stitcher to make the three smalls into a needlebook !! I love Halloween and black cats. These are perfect.